People who possess a marginal grasp of economics and business have a good idea what is going on with the Obamanomic caused economic calamity right now. True, this idiocy started when George W. Bush was in office, but just as I said YEARS ago, Bush was pretty much just like his daddy, just marginally better. To begin problem solving, you must first determine the cause of the problem. People in government do NOT handle problem solving that way, they throw money at a problem because that is the only thing they understand. This graph shows what was happening right after the Democrats took control of Washington DC and W. Bush signed their stupid raising of the minimum wage over the course of the next three years. As you can see, almost instantaneously, the DJIA begins to plummet. That is ALWAYS the case when minimum wage is raised. No one is EVER better off, the only people that experience at best a zero sum gain are the people that make minimum wage. Everyone else is negatively affected and the economy CRASHES. This has NEVER NOT happened when minimum wage has been raised. It has ALWAYS happened...get it? There is never one single time where raising the minimum wage has ever had a single positive effect on anything. NOT ONE TIME. This minimum wage increase caused everyone else to have less disposable income because all of the sudden (for no reason at all to "Progressives"), prices started skyrocketing. When people have less money, they start to cut back on stuff. It just so happened, they started defaulting on their mortgages because they purchased more house than they could afford because of stupid government forced lending practices. Anyhoo, to keep the market stable, to offset the stupidity of raising minimum wage (which always crashes the economy for one reason or another), the Federal Reserve started pumping money into the four largest banks on Wall Street to keep them afloat after all of the BAD MORTGAGES started having an adverse affect. They called this "Quantitative Easing." Normal people call it borrowing money to pay for your already borrowed money or "monetizing the debt." Those money pumps from the Fed have never stopped since November of 2008, they have only gotten larger and larger month to month. 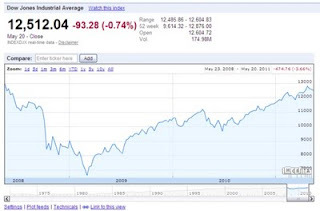 You can see from the graph that there were times when the market started making some corrections and then an event happened to start it back upward again. Those periods are EXACTLY when the Fed increased the money pumps. It defies all mathematics that to this day, the federal government continues this practice KNOWING that there is no possible way that it will work and that the QE has to come to an end at some point. QE2 ends with the month of June and Ben Bernanke has said they would no longer continue those money pumps after that time. The market is going to crash and HARD. There is nothing else that can happen. Why have they done this for so long? Quite simply, because they are stupid. They appear to honestly believe that the government can take money from the people that earned it, redirect it to the banks that did not, falsely prop up those banks, tax that money into oblivion, and NOTHING will get hurt in the process. 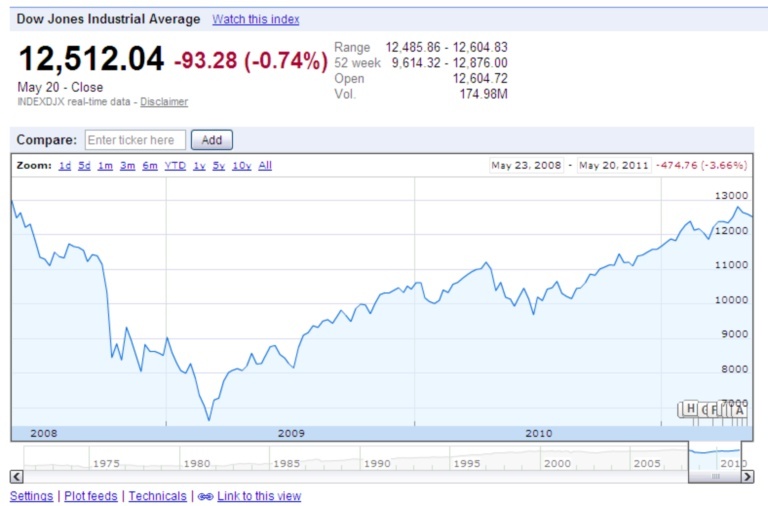 Now, what is going to happen after the market plummets at the end of June? They will start the money pumps again to keep the appearance of the market being stable. They have no other choice. All the while, what little money that we individuals STILL have will be worth even less. Prices will continue to EXPLODE because of all the excess money that has been printed. Just look at the numbers right now. My industry is dead, how about yours? Companies that pushed for ObamaCare will continue to get waivers FROM ObamaCare in ever increasing numbers. Democrats will even continue to try to kill your grandparents, too. Democrats will continue to attack the very industries that are VITAL to our survival. Unemployment is going to continue to explode. It is hovering around 22% right now. Other countries that are totally dependent on the United States for their very existence will continue to collapse. Here are 50 things that you should know about the Obama enhanced Depression. And here is about thirty minutes of Dr. Sowell telling us what is happening, what has happened, and what is going to happen, if we keep following the "Progressive" ideology that has never been successful in anything. Folks, it is way past time to light the torches, storm the Capitol, and demand our money back. Obamanomics, a futile try at Keynesian economics that has failed again. When will progressives learn that Keynesian economics has NEVER worked anywhere! Mike, they never learn anything. It is because they are stupid. What do you mean your/our money?? It doesn't belong to us...read the paper/coin money, our names aren't on it and it is controlled by the US gov't. So ask yourself does the USA control gold? No, it doesn't...so if you want "your" money back wouldn't it be best to just convert your paper trash to actual gold? or Land? Gov't cannot control gold, unless it confiscates it. I can't get past the fact that if you deal in fiat currency you will always be the slave to the owners of said fiat money. Or we can just go to a system of bartering. Roderick, I do understand your basic premise, but we HAVE to accept some other basic premises in order to live in peace together. Government serves a purpose. Number one to protect the populace from evil people. Number two is to offer some sort of currency to allow for ease of transactions between people. Paper money makes sense in the most basic way because no one wants to carry around gold or any other kind of heavy stuff. I can also understand why paper money is no longer backed by gold, too. It is a finite quantity, so backing the money with gold means there is a finite amount of wealth. Working the barter system out is your task for the day. Get on it. Banking/finance (like gov't) is parasitic. Banking/finance is about wealth extraction not wealth creation. Simple question name a study that gives a comparative advantage to a country for the number lawyers, accountants, and bankers it has? No, the comparative advantages are the numbers of engineers, mathematicians, scientists, industrialists, etc... a country has. Bartering doesn't have to be about physical objects, it could simply be I'll re-tile your kitchen if you fix my car. There is a movement called "time banking" (www.timebanks.org). Or read about time banking on wikipedia (http://en.wikipedia.org/wiki/Time_Banking). In time banking the "currency" is units of time. Let's see gov't tax units of time!! My task in been completed. The only problem I have with the bartering method is how to you make profit? Maybe lay your tile if I get two car repairs, one that I can trade for a bushel of sweet potatoes? Seems like a lot of banking time. Gimme paper money over that. Want to make a profit, buy and sell the time of others...time is the medium of exchange. It is a subversive concept, which is why I like it. All this activity going on and gov't can't do a damn thing about it...can they outlaw people doing favors for each other. Also you realize you can eat potatoes right, how many dollars can you eat if no body accepts them? Ok, so you want to be a slave to the money printers. No problem, as long as you realize your a slave and those that print the money are your masters. They can make or break you at their whim. Since you like your chains I guess that devil's bargain is par for the course. Roderick, you are right up against a really good idea, but the profit is the thing that I have problems with. Potatoes do not keep very long, gold has a finite supply, so what exactly could be carried around for your personal shopping? A little book with what everyone owes you?